Complimentary Service: A massage was provided from the Soothe app in exchange for this review. All opinions are my own, of course! Are you a massage fan? What a silly question. Who doesn’t like a massage?! Sitting all day at a computer, then coming home from work and sitting some more while I catch up on blog tasks does a number on my neck, shoulders and back. Usually, a massage are just a treat, but lately I’ve felt like it should be something that I get more regularly to treat some neck and lower back pain I have. Not to mention, there’s something about a massage that resets your mind and your mood. That’s why when I was contacted by Soothe app about their service launching in Seattle, I couldn’t wait to check it out. The cool thing about Soothe is that it’s like the Uber of massage. (And if you’re not familiar with Uber comparison, it’s just a service on demand. In this case, it’s massage therapists on demand.) 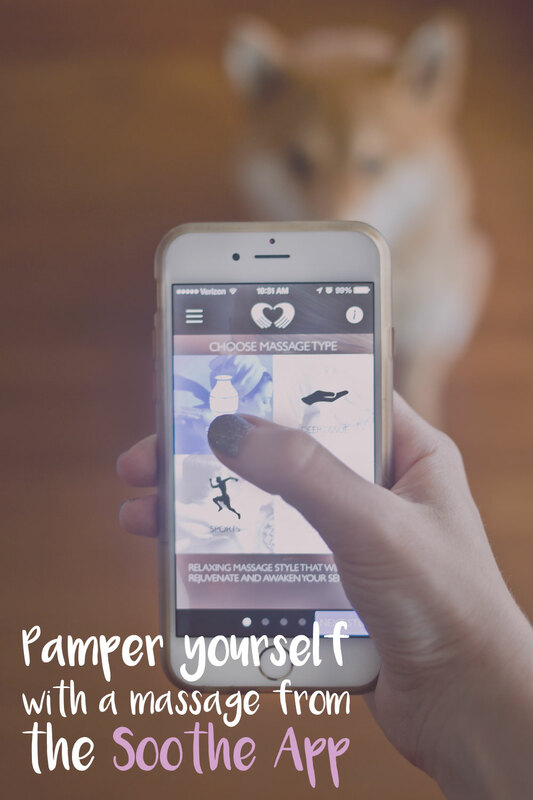 Gone is the days of calling a spa or your local massage parlor, just open the Soothe app and schedule an appointment for later that same day, the next day, or weeks in advance. The night finally arrived and my therapist, Kim C., arrived 15 minutes early. A text message previously warned me she was running early. (Which was fine, we had been home from work with plenty of time to spare.) She arrived dressed in a Soothe T-shirt, which was comforting knowing right away who was at the door. You never know these days! She made quick work of setting up her massage table while I changed into a bathrobe of my own. I figured the fewer clothes to put back on at the end the better. I had selected a Swedish Massage, and the last thing I want to do is put on clothing when I’m an oil slick. I settled in for a 60-minute massage, and it was amazing. I had no idea how I would feel about a massage happening in my living room, but honestly when someone is good at what they do, you could be anywhere and it would probably be relaxing. Kim did a great job of targeting the areas I mentioned and made sure to ask if I was comfortable with the pressure a few times throughout. The Soothe App launched this summer in Seattle but was already in several cities. You can find out which ones here, but some of the highlights are Dallas, Los Angeles, Phoenix, Chicago, Washington DC, and Miami. I wouldn’t be too worried if they aren’t yet in your area – I’m sure they will be soon! If you’re interested in trying out the Soothe App, you can sign up here and use promo code HRG30 for $30 off your first massage. (Not an affiliate code, FYI!) Massages start at $99 for 60 minutes and include all taxes and gratuities. If you compare that to spa prices, it’s not only competitive but quite a bit cheaper if you normally tip at 20%+. Have you ever tried out a service like Soothe? I’d love to hear about it if you have, and if not, I hope you give Soothe a try! I’m planning on booking a follow up massage with Kim in a couple of months! This is amazing! I hope they have it in ATL!! Haha, understandably this post caught my eye! What a neat subscription service. I don’t know why, but in some ways I feel like it’d be MORE relaxing to go into a beautiful spa to get a message than trying to do it at home where I’m surrounded by clutter, etc. Totally agreed with you! It’s nice to just open the app and book an appointment in about 30 seconds! That is the COOLEST thing ever! Thanks for sharing! That’s awesome! Whenever I think of traveling masseuses, I think of Phoebe from Friends. I’d like to have my own personal Phoebe come to my apartment! Haha. Believe it or not, I’ve never had a massage. My bridesmaid gave me a gift certificate for one though, and it’s perfect timing because I’ve been having some back pain lately and stress from planning the wedding! Ha! That’s a great comparison. Perhaps we should suggest that as their tagline ;) I hope you enjoy your first massage! They’re so nice and relaxing, and I’m sure will help your back pain! This looks amazing!! It will probably be a while before this hits Spokane, but I will so be on board when it does. I am obsessed with massages (who isn’t though, really). I know, right? Who would say no to a massage?! I hope it hits Spokane soon so you can try it out when you’re back in the States! I am so happy that I live in DC because start ups always come to us! Glad you enjoyed. I’ll definitely be trying this out soon.